Provide broad, foundational coverage of a topic, usually with an in-depth analysis.This might include textbooks, more-detailed monographs. Offer introductory overviews. You can find background information to help you select a topic and place it in the broader context of the discipline. Contain articles written and reviewed by experts in the discipline. Topics are usually more narrowly focused. Where you go for current information and topical comments, as well as for primary research information. Available in print and online and one of the first mediums to report on an event. Are written for general audiences and are meant to entertain, inform, or present an opinion. Authors are usually employed by the magazine. Available through the library and provide scholarly coverage in a variety of disciplines. Users can create playlists and create clips that can be embedded into other documents. Provide ready access to information of all kinds. They often provide valuable information, but you must carefully evaluate the credibility and reliability of web sources. These are a collection of papers reporting on presentations or posters delivered at conferences, seminars or workshops. Reports are produced by agencies and departments on specific topics or issues. These agencies can include Government departments, research establishments, charitable foundations and more. Standards are consensus agreements drawn up by representative collections of people who have a particular interest in the subject. These might be manufacturers, users, research organizations, or government departments. Manuscripts and archives are unique items which were created or collected by a person or organization in the course of their ordinary business, and retained by them as evidence of their activities, or because of the information they contain. Patents are legal documents which give the owner exclusive rights to profit from an invention, protecting it from exploitation by others unless they have the prior agreement of the patent owner. These are documents submitted for doctoral degrees and often include some of the most current and original research on a given topic. If you need... try this! Most of the time you will be asked to use scholarly or academic resources for your class. Therefore, it is important that you can tell the difference between a scholarly resource and a popular one. 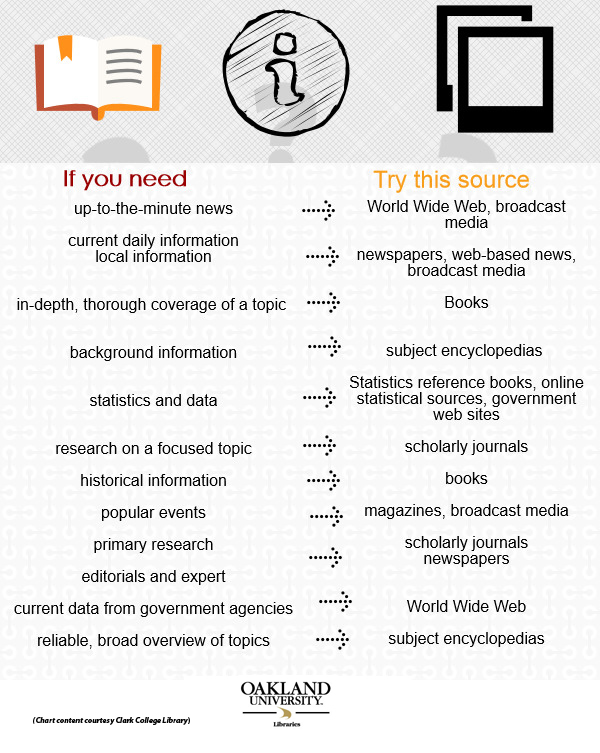 Knowing what type of information you need will help you decide which sources to use. Factual information is information that solely deals with facts. It is short and non-explanatory. The best place to find factual information is in reference books such as encyclopedias and almanacs. You can also find it in governmental statistics such as the U.S. Census. Example: Mount Magazine is the highest point in Arkansas. Analytical information is the interpretation of factual information. What does the factual information mean? What does it imply? This is the type of information that researchers generate in their studies. Analytical information is mostly found in books and journals. Example: Based on crash statistics, Arkansas State Police designated the road as dangerous. Subjective information is information from only one point of view. Opinions are subjective. You can find subjective information almost anywhere factual information isn't. It is in books, journals, websites and book reviews. Example: I hate Arkansas' hot, humid summers! Objective information is information that is understood from multiple viewpoints and presents all sides of an argument. Reference books are a good place to find objective information. Newspapers that have balanced and fair reporting are also objective. Opposing Viewpoints and Facts on File are both great objective databases. Example: While many people don't like Arkansas summers, some look forward to the season so they can travel.